“Everything Else,” a group show curated by CHRIS CHURCHILL at FRANKLIN PARRASCH GALLERY in NYC features the work of 16 artists but to be honest, it’s notable primarily for the inclusion of just one: the ever-elusive gallery ghost known as KAWS. Sidestepping the formal art world almost entirely in recent years, choosing instead to sell paintings—many of which were top flight large-scale works—directly to private collectors, the streetwear & collectibles phenomenon known to his parents as Brian Donnelley put the brakes on a formal art career primed for takeoff following his debut installation at Manhattan’s New Museum in 2000. Choosing instead to publicly focus on a burgeoning merchandise empire in recent years, his inclusion in this show (one submission includes his 4′ Companion figure but it’s always been more of a sculpture than a “toy” anyway) is particularly relevant as it marks an official return to the gallery world with several large shows currently in the works. Also included in this show, which seeks to examine why “things” get made and questions “what are the demands of a culture that prompts such production and how do the products of everyday life touch on the spiritual and the immaterial?,” are original artworks by Jason Adkins, Bryan Bowie, Anthony Campuzano, Jason Frazier, Misaki Kawai, Michael J. Kelly, Wook Kim, Wes Lang, Sandra Eula Lee, Rebecca Potts, George Stoll, Keith Tallett, Xavier Veilhan, Jocko Weyland, and Jesse Wine. 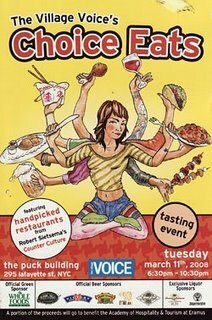 “Choice Eats”, an event hosted by the Village Voice, featuring restaurants handpicked by Robert Sietsema of Counter Culture fame. The event was located at the historic Puck Building in Manhattan and included more than 30 restaurants from all boroughs except Staten Island. Fatty Crab (643 Hudson St.) – Zak Pelaccio’s most acclaimed restaurant was handing out short ribs that had the whole building buzzing. So much so, they were the first restaurant to sell out. Kampuchea (78 Rivington St.) – This LES noodle bar boasted premium pork ribs. While the line was wrapping around the building, we were lucky enough to bypass it telling them we were from the highly regarded blog: Bellybusters. Pacificana (813 55th St., Brooklyn) – Hailing from BK, this spot brought a Schezuan Chicken that tasted like a combination of sesame chicken and general tso’s — a combo we believe cannot be denied some praise. Xuntas Tapas Bar (174 1st Ave.) – With a shot to differentiate itself from the influx of tapas restaurant in this city, they served a boring grilled chorizo. Pretty lame, they certainly did NOT bring their A-game with an outing like this. Maremma (228 W. 10th St) – Being one of the few restaurants we had previously been to, we couldn’t have been more disappointed. The thinly sliced ham with beans and olives was almost inedible. There is no excuse for this since we recently dined at Maremma and enjoyed a pretty good meal. Its mind-boggling that they couldn’t pull it together for an event like this. Fette Sau (354 Metropolitan Ave., Brooklyn) – We could not have been more excited to see what this spot cooked up tonight. We’ve been waiting to try this place forever after hearing great things from anyone who has ever been. Looks like we will have to wait a big longer: Fette Sau was the only no-show of the event. That, or we took one too many jager shots from the incredibly tempting FREE jager stand and stumbled right past it! The Museum of the Moving Image in Astoria, Queens, is presenting a 33-title retrospective of his work, including new prints of films like his 1966 sensation “The Chelsea Girls” a sampling of the 472 “Screen Tests” he shot of Susan Sontag, Lou Reed and other fabulous scene-makers; and excerpts from early minimalist epics like the eight-hour “Empire” (1964) and the 5-hour 21-minute “Sleep” (1963. The museum will also present “A Walk Into the Sea: Danny Williams and the Warhol Factory,” a documentary about a filmmaker who had been one of Warhol’s intimates, and “Beautiful Darling,” a work in progress about Candy Darling, a notable figure in what the museum is calling “Warhol’s World.” For film lovers there is no more important show in town. In the years since his death in 1987 from a heart attack at 58 (or thereabouts), after undergoing gall bladder surgery, Warhol has continued to make money and headlines with his fine art even as his films have remained largely from view. In May a new record for his work was set at a New York auction when a 1963 painting of a car crash was sold to an anonymous buyer for $71.7 million. Meanwhile, in the 2006 fiction film “Factory Girl,” about Edie Sedgwick, his most famous superstar, Warhol’s already creepy mainstream profile reaches its nadir with a portrait of the artist as the embodiment of 1960s urban decadence, a gay vampire sucking the life out of an innocent led astray. That swish thing is critical to Warhol’s films, where beautiful butch boys in tight jeans and leather jackets share the screen with transvestites in elegant dime-store drag. Ms. Sedgwick may have been his most famous superstar (at least the one now most likely to adorn a book jacket), and plenty of women crossed in front of his camera. But it’s all the male bodies – adorned, adored and at times stripped bare – that underscore the radical politics of Warhol’s gaze. “OUR movies may have looked like home movies,” Andy Warhol wrote, responding to one of his critics, “but then our home wasn’t like anybody else’s.” From 1963 through 1968 Warhol shot hundreds of these home movies, work that is short and dauntingly long, silent and sound, scripted and improvised, often in black and white though also in color, still as death and alive to its moment. Awkward, beautiful, raw, spellbinding, radical — they are films like few others, in part because, first and foremost, they are also sublime art. Yet in Warhol’s films the illusions of Hollywood, with its seamless narratives and industrial imperatives, are self-consciously replaced by other illusions, notably those pertaining to identity. The performers in his films play a shifting catalog of roles — biker boy, hustler, debutante, faded movie queen, aged grand artiste — that are simultaneously constructed and poignantly real. This is who we are, each seems to say, whether aggressively staring into (or perhaps, more accurately, staring down) the camera or pretending to ignore it altogether. Though Warhol rarely appears on camera, the films feel profoundly autobiographical; they’re individualistic records of the world in which he played, made art and helped construct his own slippery, elusive identity. They are part ethnography, part memento mori and wholly personal. Warhol withdrew his 1960s films from circulation around 1970, two years after he was almost shot to death by Valerie Solanas, a freaked-out feminist who makes a startling appearance in a stairwell in his 1967 film “I, a Man.” (She harasses the film’s title character, a hustling Adonis whose supposed “squishy” rear end she derides.) While Warhol was in the hospital recuperating, Paul Morrissey, the name most associated with Warhol’s cinematic output, directed the feature-length narrative “Flesh.” After recovering from his wounds, at least physically, Warhol made only one other film himself, “Blue Movie” (in which a man and woman have coitus uninterruptus), in the fall of 1968. Mr. Morrissey directed other films, including “Andy Warhol’s Dracula” and “Andy Warhol’s Frankenstein,” which Warhol helped produce. 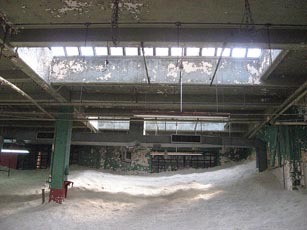 In 1966 Warhol began screening his films as part of multimedia extravaganzas initially called the Erupting Plastic Inevitable that he, the Velvet Underground and other Factory members mounted at the Dom, a Polish dance hall turned discotheque on St. Marks Place. (Erupting later grew into Exploding.) Warhol and others projected films like “Empire” and “Vinyl,” slipping colored gels over the images, while the Velvets bombarded eardrums, strobe lights pulsed and the demimonde danced with the uptown gawkers. To publicize the event Warhol and company took out a newspaper ad for the opening that seductively beckoned with the words “Come Blow Your Mind.” Rarely has there been so much truth in advertising. On View at the Museum of Moving Images, Queens, NY, from October 20 through November 11, 2007. Sneaker Pimps – The World Largest Cultural Street-Art Lifestyle Exhibition Hits NYC. “Sneaker Pimps“ is the worlds largest touring sneaker show featuring over 1000 pairs of rare, limited edition, vintage, celebrity signed, artists collaborated sneakers and a collection of sneaker inspired artwork, fashion and photography hits NYC on Friday, October 14, 2007. Featuring original artworks by Futura, Stash,Doze, Shepard Fairey, Dave White, Cope2, Ghost, Ewok, JB Classics, Methamphibian, Jor One, SBTG, Kinsey, TechVector, C2, EricQ, Jeremy Fish. At a time when modern high-rise condos are transforming much of NYC’s landscape, it’s more and more important to preserve what makes the city unique. U.K. artist Mike Nelson embraces this sentiment with his first major installation in the U.S., “A Psychic Vacuum,” presented in conjunction with Creative Time. Imagine a derelict building located in Manhattan’s Lower East Side—former home to the bustling Essex Street Market and soon to be hot real estate commodity—its neglected innards a history lesson unraveled beneath peeling layers of paint and gleaned through the things left behind, disparate objects as easily rescued from your grandparent’s attic as from the local dump. Here, Nelson gathers the clutter into meticulously crafted environments to form his dusty homage to the vanishing past. Wandering along a seemingly endless labyrinth of dimly lit passageways through ranks of mismatched doors, the audience is transported into Nelson’s shadowy world of back alley dentists, gypsy fortune tellers and blue collar VFW bars. With each turn, you seesaw between the role of fascinated explorer and anxious interloper simultaneously anticipating and dreading the anonymous occupants’ return. All of Nelson’s carefully selected details create a running narrative that at once interprets the (now endangered) character of the neighborhood as a relic forgotten as the days pass by, while at the same time revering it as a still vital participant in the flow of daily life happening on these streets. With curiosity and persistence, you will finally emerge from the simulated catacombs into the light of day, only to be confronted by the biggest revelation of the entire journey…but some secrets are best revealed firsthand. The show is open Friday through Sunday from 12-6pm and admission is free. While some have already dismissed skull imagery as a passing trend, we think when it’s done right it can be a timeless memento mori. If you’re anything like us, you’re going to enjoy “I Am As You Will Be: The Skeleton In Art,” a group show that opened last week at Cheim & Read Gallery in Chelsea. 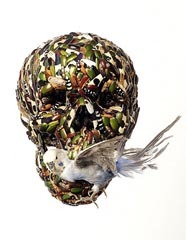 Like the title of the show suggests, the attraction to the subject has to do with our shared corporeal experience, which artists in the show have interpreted using clever, horrific and, at times, alluring imagery. The exhibit brings together more than 30 works by a who’s who of artists, including Jean-Michel Basquiat, Edvard Munch, Pablo Picasso, Salvador Dali, Andy Warhol (below left), Sigmar Polke, Matthew Barney, Jan Fabre (above right) and Damien Hirst, among others.